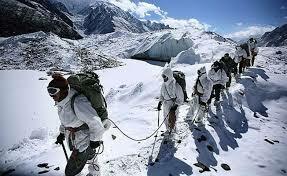 PUNE: Maintaining vigil at the world's highest battleground - situated at 6,700 m - is a test of human endurance against frosty winds, tough terrain, massive expanses of snowfields, crevasses, and thin oxygen levels. As Indian soldiers pant for breath at the 76-km-long Siachen glacier, a Pune couple has decided to contribute to the construction of an oxygen plant at 13,000 feet. Sumeedha and Yogesh Chithade have set an example by selling their jewellery to raise Rs 1.25 lakh for the oxygen-generation plant, which would cost around Rs 1.10 crore. Sumeedha, the mother of a serving army major, even sold her earrings. She believes that charity begins at home - for she considers the army as her family. "I have been working for army welfare since 1999. When I was at the Siachen base camp, I realised the climate there is extremely harsh. Even in summers, the temperature is at -35 degrees [Celsius] and it drops to -55 in winters. Our soldiers, who plod through 35-40 feet deep snow at the risk of developing snow blindness and frost bite, are lonely and cut off from their families and friends," Sumeedha said. This plant will be used to refill oxygen cylinders used by the Army. "It is so easy for us to breathe here, but at 22,000 feet, it is extremely difficult to breathe. I have not sold every ornament, but made a beginning. I will contribute more if required," said the school teacher. The Chithades have formed a charitable trust and registered it with the Charity Commissioner Office in Pune. There are five other trustees, who also want to contribute money. Yogesh, who took premature retirement from the Indian Air Force, mentions some advantages of having the plant. "Oxygen cylinders brought from Chandigarh are delivered at 22,000 feet. At times, there are no copters to deliver cylinders. When the plant comes up, transportation cost and time will be reduced," he says. "The plant will benefit around 9,000 soldiers, who are doing a great sacrifice by guarding our borders in that area," Yogesh says. "Other families should contribute too, at least Re 1 each," adds Yogesh.